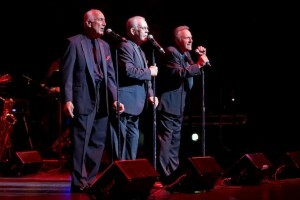 On October 12 Kathy Young and THE INNOCENTS were inducted into The Doowop Hall of Fame in Boston. and thankful for the opportunity to make music together, creating the music was the Best part! The Innocents were recognized for their own work on songs such as “Honest I Do”, “Tick-Tock”, and “Gee Whiz” as well as their collaboration with Kathy Young & THE INNOCENTS on “1000 Stars” and “Happy Birthday Blues”. Our heartfelt thanks to Everyone for their appreciation and support over the years-! The new CD-available at amazon.com. 28 tracks remastered by Ace Records of the group’s work after Indigo when they were signed to Reprise, Decca, Warner Bros. with out takes and the final 45 releases included. Also some additional treats included. Ace put together a 8000 word booklet for the CD with group interviews and history of the group and pictures as well as an overview of the happenings of the Los Angeles music scene at the time. 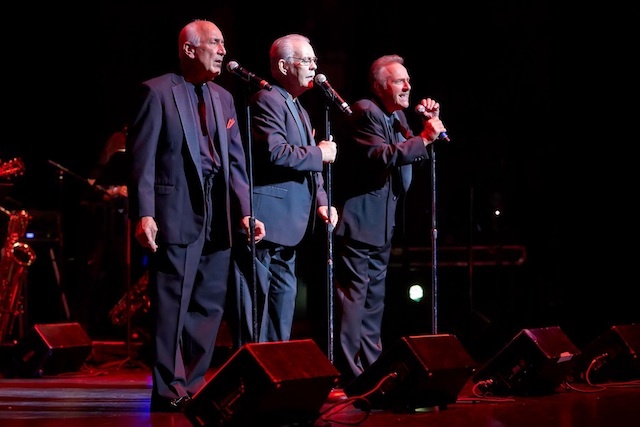 WE THANK YOU FOR ALL YOUR SUPPORT OF OUR MUSIC THESE MANY YEARS!! 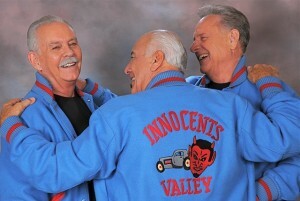 The Innocents, a harmony trio from Sun Valley, Ca., scored four quick hits-twice in their own right with “Honest I Do” and “Gee Whiz”, and twice with Kathy Young (‘A Thousand Stars’ and ‘Happy Birthday Blues’)-on the mysterious Indigo label of LA. Following its collapse in 1962, the cool trio went on to record equally strong material for Reprise, Decca, and Warner Bros, all of which is heard here, together with previously unissued masters from the same period in stunning stereo. None of this-even the tunes originally released on 45s back in the 60s-has ever appeared on CD before. Better still, the cache of unissued Warner Bros and Reprise material is worth the price of the CD alone. Also included are 2 versions of The Innocents superb rogue 45, ‘Tick Tock’. A couple of the guys later moonlighted as the Sugar Beats on an A&M single, and that’s here too. 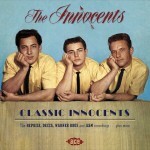 “Classic Innocents” serves as a companion volume to Ace’s previous “The Complete Indigo Recordings”, to this day a popular catalogue item. 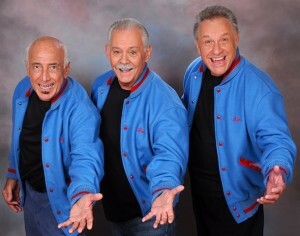 The new CD contains a substantial (8000 word) narrative describing the trials and tribulations of the three all-American boys, interlaced with rare personal memorabilia from surviving members Jim West and Al Candelaria. The mastering, as you’d expect, is state-of-the-art. If you’re wondering why a couple of the tunes, “Honest I Do” and “In the Beginning”, appear on both CDs, that is because they are quite different versions. The earlier CD inadvertently featured an outtake of “Honest I Do” missing the bass and brushes heard on the actual 45. This CD includes the correct Indigo single master. Similarly, “In the Beginning” is the correct 45 version not the substantially different take heard on “The Complete Indigo Recordings”. 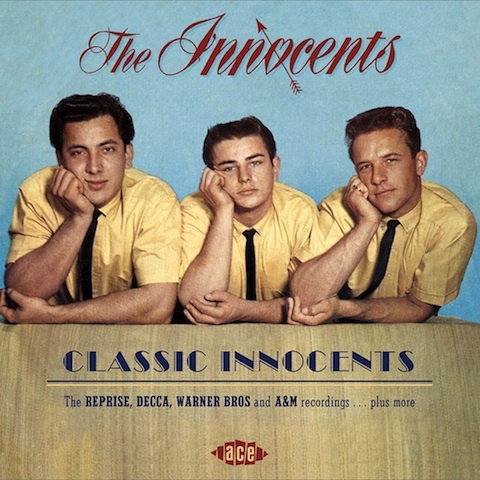 West recorded a rare solo singe for the label as Bobby James and that too has been included, neatly squaring the circle by making The Innocents entire recorded output available on Ace. and another 7 CDs which include “1000 Stars” by Kathy Young with The Innocents on the expanded set. They really did a great job on this, probably the best we’ve heard! AN ORIGINAL MEMBER OF OUR CAR CLUB–THE INNOCENTS) JOE CAMPBELL, HAS JOINED US DOING DARRON’S MELODY PART. JOE WORKED WITH US IN THE EARLY 1960’S ON OUR ALBUM. HE IS A GREAT ADDITION TO THE SOUND!